Sometimes a project just comes together and the results are delightful. Recently I sorted out my remnants basket which was full of many shades of silk dupion. I arranged some in clusters that looked good together for when I next stitched out a crazy quilt. One of the beauties of silk dupion happens when two colours are woven creating unique shot silk! This type of silk is my favourite especially if you are blending silks together in a crazy quilt! 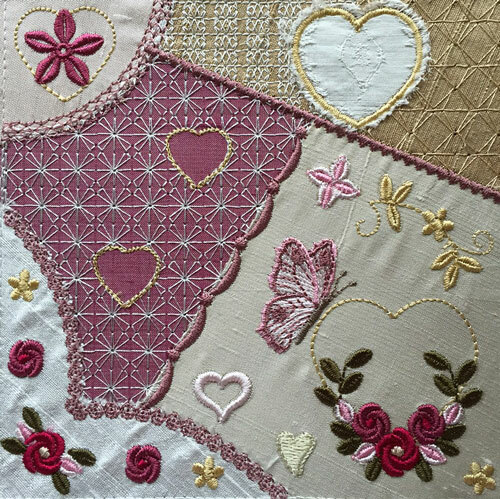 With February looming it was time to create a Valentines Crazy quilt and last week I grabbed five pieces of silk which I had grouped together and tested it out! The fabrics worked so well as did the embroidery, reminding me of a beautiful china cup! Notice the green silk has a pink hue to it as it is shot with pink, and the deep pink at the top is also shot with grey. 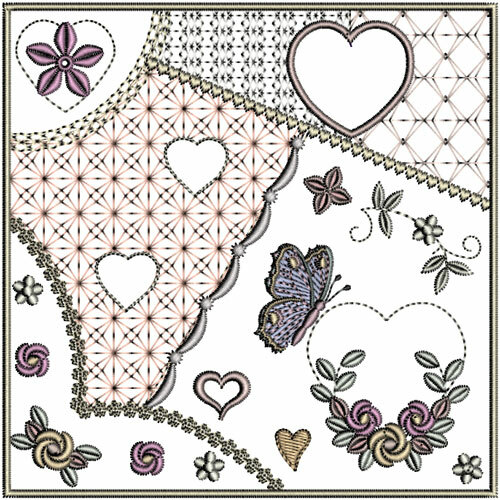 There are hearts galore in this block, large and small with a large heart peeping out at the bottom and an applique one for you to decorate. You may want to consider adding some lace to it or a damask type of fabric. I have already introduced curved edges in my crazy quilts but this one has a more challenging double curve at the top of the large heart. There are also some large quilting stitches by the applique heart that you will have to be careful not to trim by mistake like I did! I shall cover that mistake when I embellish. You may recognise some of the designs in this block but there are some new ones too, little bullion flowers which are from a Smocking collection I hope to released later this year and some intricate leaves on the bottom left from a White work collection also in development. I have left plenty of spaces for your own personal embellishment on this block so you can do something special with it. This is the smaller block for those with 5″ wide hoops. 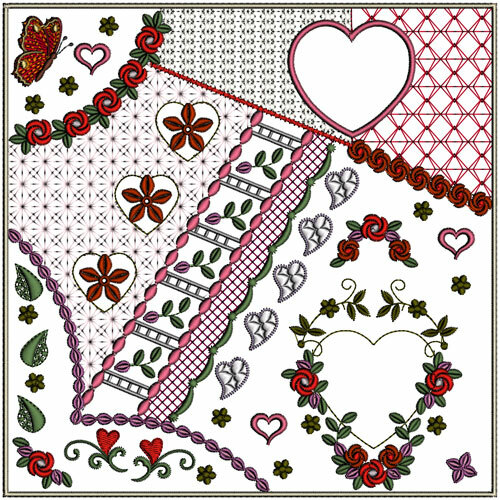 Now I know that not everybody will want a delicately pretty quilt block as we tend to go “red” for Valentines Day, so I pulled up the design in my software and gave it the “red” treatment. Those of you how know me well will realise that this is not my favourite type of colouring but I know that some of you will prefer it. Having tested out these blocks it was time to embellish them which I was very excited about. There couldn’t be any red silk roses, as strangely there doesn’t seem to any silk ribbon in deep red in my stash. Never mind! I will get some for next year as I am sure I will be doing another quilt this time next year. I found plenty of other suitable buttons, motifs, lace and charms though! Do remember if you haven’t got something improvise or create it yourself. Now I could select a design from Natalie’s Wedding Day, Floribunda’s Serenade or Victorian Promises, and edit and stitch it out on organza creating my own little motif in red. 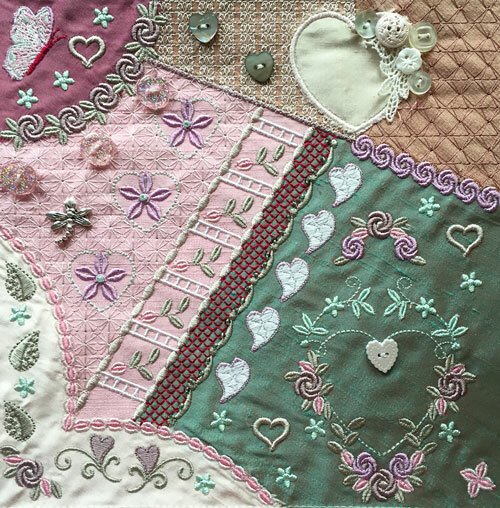 I have spent quite a lot of time surfing the internet looking for suppliers, books and tutorials on crazy quilting as I am quite hooked on these little works of art upon which you can stamp your own individuality. There is also something relaxing and enjoyable about having to do some hand sewing after the embroidery is done. 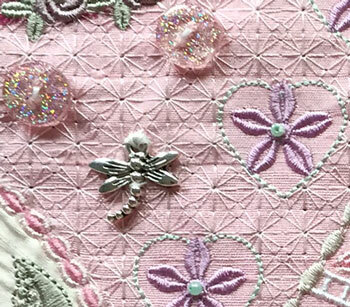 I found some delightful lace and cut one piece of it laying it on the right hand side of the applique heart and attaching buttons on top of it. I will add pearls to this cluster. Finding small buttons can be quite difficult but essential to keep the proportions right. It doesn’t matter if you have some fabric showing outside of the satin stitches that surround the applique heart but if they are all around it gives it a shabby chic look! My mother of pearl buttons pick out the green hue in the silk. I choose a pewter dragonfly and some seed beads to embellish the top left hand area. The large pink buttons looked OK as they were almost clear and I popped a small bead in the centre of each flower. In the past I have added my crystals first but decided to leave them to last this time around to see if that worked better. As you can see I have not introduced too many colours into this block which I think is the secret. Using the correct threads is important especially in the embroidery that joins one segment to another. Now this is the smaller of the blocks for those with at least 5″ wide hoops. I tried to go as bright and “red” as I could manage but you can see I failed dreadfully. However the dark pinks and golds worked well. This needs to embellished and unlike the embroidery which takes minutes more time is required to get the blocks fully embellished. 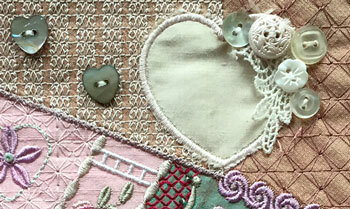 I used a little washed silk dupion for my applique heart and as it is so small I left a rugged edge on it. I suppose you could trim it after the embroidery is all finished as it can be quite difficult with smaller hoop. Obviously I removed the hoop from the machine and was able to trim a little easier by gently pushing the fabric up from underneath. I think I shall continue my embellishment over the next few days and share the final results with you when they are complete. Looking at the many crazy quilts on Pinterest I think mine are quite minimal but I will endeavour to do a little more decoration than normal providing it all co-ordinates. These blocks are being released at Graceful Embroidery tomorrow (February 6th, 2015) but I think one more trip is needed to my local craft store for just a few more bits and pieces, then I will have to think about another block with an Easter theme! I am sure they will have something there to inspire that block too! Nearly forgot to show the whole of the large block. As you can see there is a great deal of space to make it even more beautiful! This entry was posted in Embroidery projects, Inspirational, New Designs and tagged Crazy quilting, Embellishment. Bookmark the permalink. 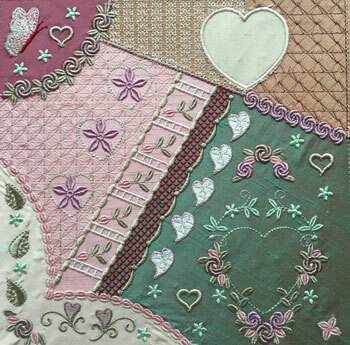 6 Responses to A Valentines Crazy Quilt block! when is this design available for purchase? I am releasing the designs later today. It is not showing on this page at the moment but should be there later today or tomorrow. There I was, reading along and thinking that your crazy quilt blocks are works of art and saw where you said the same thing. They’re breathtaking, Hazel. No one could do it any better than you.